The environmental advocacy group tested almost 30 General Mills (GM) and Quaker brand products made with conventionally-grown oats and discovered traces of glyphosate in 28 of them, including several types of Cheerios, instant oatmeal, and cereal bars. 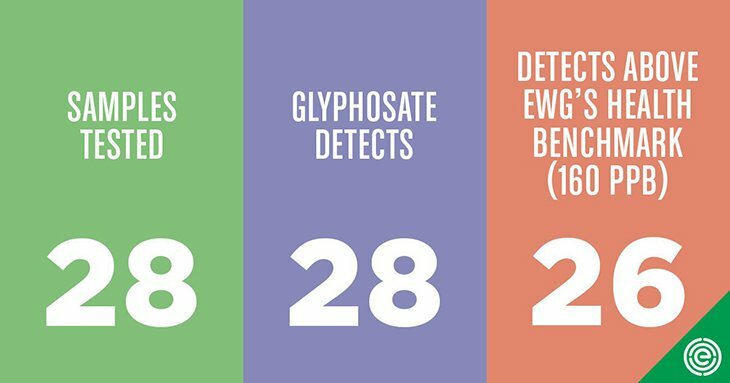 Glyphosate levels exceeding EWG’s own safe limit of 160 parts per billion (ppb) were found in 26 of the products. “How many bowls of cereal and oatmeal have American kids eaten that came with a dose of weedkiller? That’s a question only General Mills, PepsiCo [owner of Quaker], and other food companies can answer. Just 2 months ago, initial tests commissioned by EWG showed glyphosate in 43 of 45 products containing conventionally-grown oats, more than 2/3 of which had levels above the group’s safety limit. If General Mills, PepsiCo, and other food companies switched to organic oats, that wouldn’t necessarily guarantee their products are glyphosate-free as EWG suggests, however, since the group also discovered the Roundup ingredient 1/3 of 16 products made with organic oats in August. But as the EWG points out, the EPA’s limits were set in 2008, about 7 years before the International Agency for Research on Cancer (IARC) declared glyphosate “probably carcinogenic” to humans in 2015. The group also noted that industry lobbying can significantly influence federal safety limits. In August, the jury awarded Dewayne Johnson $289 million in total, including $250 million in punitive damages against Monsanto, now Bayer. The judge in the case ultimately reduced the punitive amount to about $78 million but upheld the jury’s conclusion that glyphosate caused Johnson’s cancer, and that Monsanto knew the weed-killing chemical caused cancer but failed to warn the public.